Bakson's Sunny Herbals Body Oil Increase Blood Flow, Soften Dry Skin, Moisturize & Nourish Skin, Supple Skin, Glowing Skin. Making Skin Soft, Supple & Glowing. It increases the blood flow, providing relief and healing where needed and making skin soft, supple and glowing. With Essential Oils and Extracts of Aloevera, Arnica and Hypericum. A skin quenching massage oil with goodness of Sesame, Olive, Almond, Rosemary & Lavender sure to mesmerize with its nourishing, calming and warming benefits. It increases the blood flow, providing relief and healing where needed and making skin soft, supple and glowing. 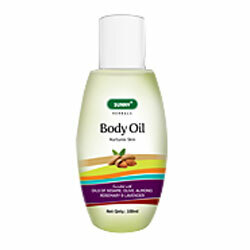 Seasame Oil : It penetrates skin deeply to pacify stress related symptoms. Olive Oil : Naturally rich in Vitamin E and other powerful anti oxidants, it contributes to cell repair. Almond Oil : Classic nurturing oil to moisturize, nourish and soften dry skin. Rosemary Oil : It therapeuctically acts as an astringent, antidepressant, nervine and as a stimulating agent. Lavender Oil : It possesses the ability to remove tension, relieve pain and enhance blood circulation. Spread the oil on ypur palm and apply it lightly all over the body, using circular massaging motions. Use before or after bath for availing best benefits.